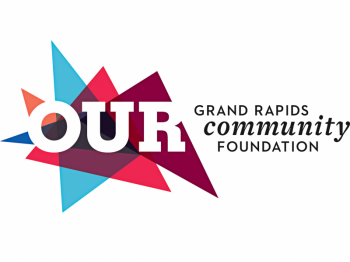 A 12 week art therapy program is being offered by two professional art therapists in Grand Rapids. Imagine a place where you can bring your authentic stories, the pain, hurt, joys and distress without any judgment. A place where you are safe to share your struggles, past and present and you are able to process your stories to grow and live a healthier version of yourself. A place where you may not even be able to talk about what is going on and can still receive the help you need. A place where you are validated and when you are feeling lost can receive professional help through creativity. Heartside Ministry’s Art Therapy program offers such a place. 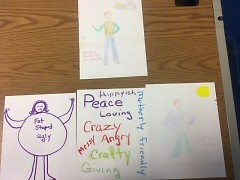 The bottom left is where this participant reflected on her own self-image which was done at the beginning of the program. As the program continued she created a self-image with words categorizing different pieces of her as an image from other’s points of view. The top image is this participant’s goal, where she would like to see herself. This image she explained is an image of a strong woman and one she admired. The image on the bottom right is her self-image towards the end of the program. Visually she grew in her self-identify, confidence and is closer to the person she wants to become and most importantly seeing herself in a more positive way as compared to the first image. She now sees herself as a stronger person where she can live a life where there can be joy and sadness along with resiliency. By the time the program was completed, this participant self-reported improvements in several aspects of her life. Some of these include an overall sense of well-being, satisfaction with life, more positive social relationships, physically felt healthier and felt she was in a more frequent better mood. 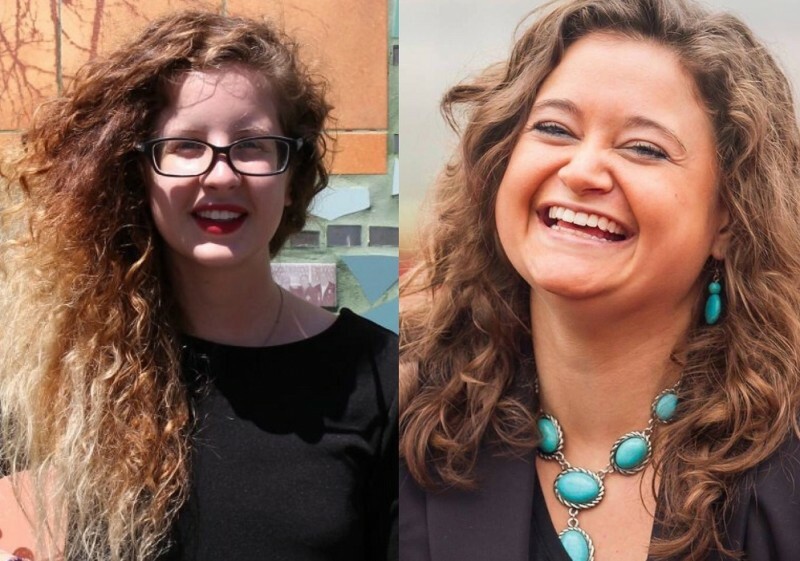 A 12-week Art Therapy program is being offered by two professional Art Therapists in Grand Rapids, Leara Glinzak and Jess Kimmel. Both ladies have a Master of Science in Art Therapy with a concentration in Counseling and meet the accreditation standards to practice as Art Therapists according to the American Art Therapy Association. 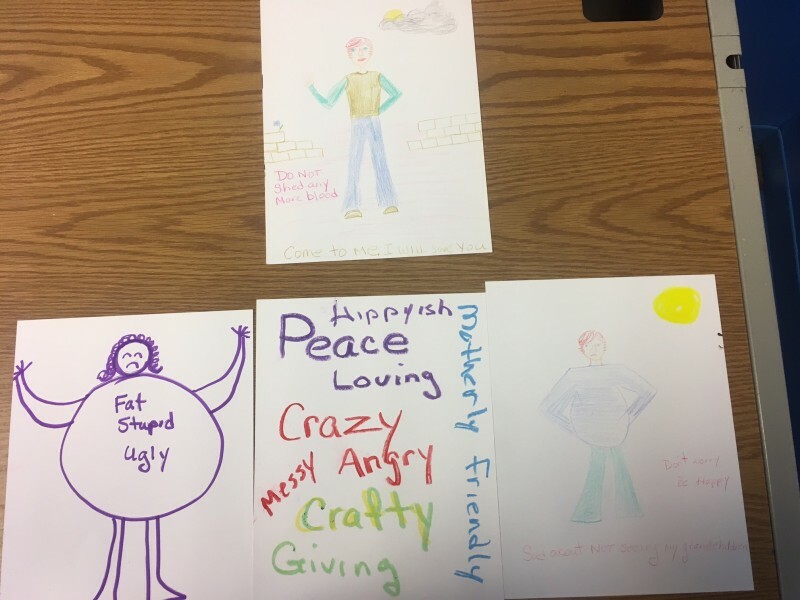 To practice as Art Therapists these ladies have a background in human development, psychological theories, art and creative processing in order to guide someone through a visual process to meet specific goals in group therapy. 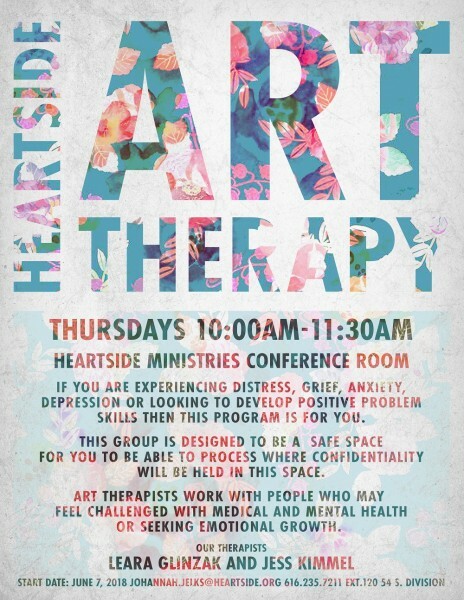 Leara has done the 12 week program at Heartside Ministries and together these two Art Therapists are combining their backgrounds to best meet the group’s needs. Have I experienced grief or trauma and it is still affecting my life in a negative way? Do I need to work on positive healthy responses rather than acting out of frustration and anger? Could I benefit from developing healthier coping skills? Do I need more resiliencies in my life? Am I lacking a positive, supportive community in my life? Do I need to access more creativity in my life when faced with barriers to my own growth and distress? This is a closed group for 1.5 hours of time which include an Art Therapy directive and all materials will be provided. A common misconception is that you need to be in Artist to participate. The truth is Art Therapy requires no artistic skill. Rather than focusing on the art product Art Therapy is emphasized through the process. This group will take place in the Chapel of Heartside Ministries on Wednesdays October 17, 2018-December 19, 2018 from 1pm-3pm.